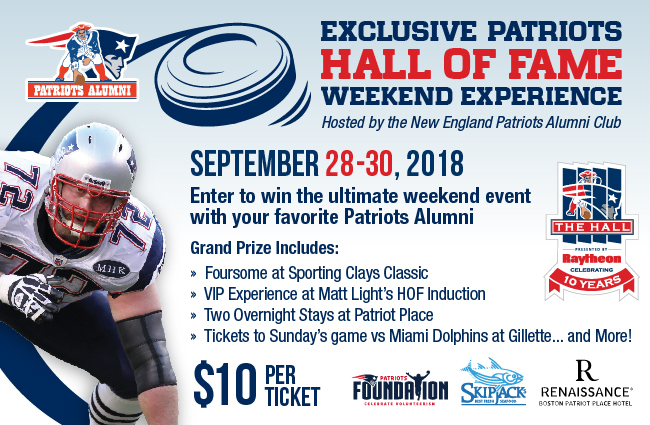 The New England Patriots Alumni Club is hosting its first Exclusive Sporting Clays Classic & Hall of Fame weekend experience raffle. A chance to win only costs $10, and the winner receives a three day package of Patriots Alumni events. Take a shot and enter to win this once-in-a-lifetime prize. To learn more about participating in the Patriots Alumni 2nd annual Sporting Clays Classic tournament, click here. The proceeds benefit our mission and programs, to provide an opportunity for former Patriot players to remain actively involved with each other, the Patriots organization, and the community by supporting and funding youth football throughout New England with programs that emphasize leadership, teamwork and achievement through lessons learned on the football field. The New England Patriots Alumni Club, Inc. is recognized as a non-profit organization under Section 501(c)(3) of the Internal Revenue Code. Two home game tickets: Patriots vs Miami Dolphins with a parking pass and pregame on field experience. Follow us on social media to be the first to know who won! Eligibility. Raffle only open to individual legal residents of the fifty (50) United States (excluding CA, FL, NY, Puerto Rico, territories and possessions) who have attained the age of majority in their state of residence as of the date of entry into the Raffle. Raffle Tickets. Raffle tickets may be purchased for Ten Dollars ($10.00) online at www.patriotsalumni.com. There is no limit on the number of raffle tickets sold. Prizes and Odds. There will be one (1) Grand Prize Winner. All Prizes are provided “as is” and without any warranty of any kind. By accepting the Prizes, winner acknowledges compliance with these rules.